Definition at line 714 of file llfloatersnapshot.cpp. Definition at line 717 of file llfloatersnapshot.cpp. Definition at line 720 of file llfloatersnapshot.cpp. Definition at line 940 of file llfloatersnapshot.cpp. References LLControlGroup::getBOOL(), gSavedSettings, and LLSnapshotLivePreview::updateSnapshot(). Referenced by onClickAutoSnap(), onClickHUDCheck(), onClickKeep(), onClickKeepAspectCheck(), onClickUICheck(), onCommitCustomResolution(), onCommitLayerTypes(), onCommitQuality(), and onCommitResolution(). Definition at line 1191 of file llfloatersnapshot.cpp. References LLUICtrlFactory::getComboBoxByName(), LLComboBox::getItemCount(), and LLComboBox::setCurrentByIndex(). Definition at line 786 of file llfloatersnapshot.cpp. References LLSD::asString(), LLPanel::childGetValue(), LLViewerWindow::SNAPSHOT_TYPE_COLOR, LLViewerWindow::SNAPSHOT_TYPE_DEPTH, LLViewerWindow::SNAPSHOT_TYPE_OBJECT_ID, and type. Definition at line 764 of file llfloatersnapshot.cpp. Referenced by LLFloaterSnapshot::draw(), onClickAutoSnap(), onClickHUDCheck(), onClickKeep(), onClickKeepAspectCheck(), onClickNewSnapshot(), onClickUICheck(), onCommitCustomResolution(), onCommitLayerTypes(), onCommitQuality(), onCommitResolution(), onCommitSnapshotType(), updateControls(), and updateLayout(). Definition at line 771 of file llfloatersnapshot.cpp. References LLSD::asString(), LLPanel::childGetValue(), LLSnapshotLivePreview::SNAPSHOT_BITMAP, LLSnapshotLivePreview::SNAPSHOT_POSTCARD, and LLSnapshotLivePreview::SNAPSHOT_TEXTURE. Referenced by onCommitSnapshotType(), and updateControls(). Definition at line 1018 of file llfloatersnapshot.cpp. References checkAutoSnapshot(), LLCheckBoxCtrl::get(), getPreviewView(), gSavedSettings, and LLControlGroup::setBOOL(). Definition at line 949 of file llfloatersnapshot.cpp. Definition at line 1044 of file llfloatersnapshot.cpp. Definition at line 959 of file llfloatersnapshot.cpp. References LLView::addChild(), LLFloater::addDependentFloater(), checkAutoSnapshot(), LLFloater::close(), FALSE, LLControlGroup::getBOOL(), getPreviewView(), LLSnapshotLivePreview::getSnapshotType(), gFloaterView, gSavedSettings, gSnapshotFloaterView, gViewerWindow, LLViewerWindow::playSnapshotAnimAndSound(), LLView::removeChild(), LLSnapshotLivePreview::saveLocal(), LLSnapshotLivePreview::savePostcard(), LLSnapshotLivePreview::saveTexture(), LLSnapshotLivePreview::SNAPSHOT_POSTCARD, LLSnapshotLivePreview::SNAPSHOT_TEXTURE, and TRUE. Definition at line 1065 of file llfloatersnapshot.cpp. Definition at line 1057 of file llfloatersnapshot.cpp. References LLCheckBoxCtrl::get(), gSavedSettings, and LLControlGroup::setBOOL(). Definition at line 1007 of file llfloatersnapshot.cpp. References getPreviewView(), TRUE, and LLSnapshotLivePreview::updateSnapshot(). Definition at line 1031 of file llfloatersnapshot.cpp. Definition at line 1201 of file llfloatersnapshot.cpp. References checkAutoSnapshot(), comboSetCustom(), getPreviewView(), LLSnapshotLivePreview::getSize(), gSavedSettings, llfloor(), S32, LLControlGroup::setS32(), and LLSnapshotLivePreview::setSize(). Definition at line 1092 of file llfloatersnapshot.cpp. References LLCheckBoxCtrl::get(), gSavedSettings, LLControlGroup::setBOOL(), and updateLayout(). Definition at line 1161 of file llfloatersnapshot.cpp. References checkAutoSnapshot(), LLComboBox::getCurrentIndex(), getPreviewView(), and LLSnapshotLivePreview::setSnapshotBufferType(). Definition at line 1078 of file llfloatersnapshot.cpp. References LLSD::asReal(), checkAutoSnapshot(), getPreviewView(), LLSliderCtrl::getValue(), llfloor(), and S32. Definition at line 1108 of file llfloatersnapshot.cpp. References checkAutoSnapshot(), LLPanel::childSetValue(), LLSDSerialize::fromNotation(), LLUICtrlFactory::getComboBoxByName(), LLComboBox::getCurrentIndex(), getPreviewView(), LLControlGroup::getS32(), LLComboBox::getSimpleSelectedValue(), LLSnapshotLivePreview::getSize(), LLViewerWindow::getWindowDisplayHeight(), LLViewerWindow::getWindowDisplayWidth(), gSavedSettings, gViewerWindow, height, S32, LLControlGroup::setS32(), LLSnapshotLivePreview::setSize(), and width. Referenced by LLFloaterSnapshot::postBuild(), and setResolution(). Definition at line 1179 of file llfloatersnapshot.cpp. References getPreviewView(), getTypeIndex(), gSavedSettings, LLControlGroup::setS32(), TRUE, updateControls(), and LLSnapshotLivePreview::updateSnapshot(). Definition at line 801 of file llfloatersnapshot.cpp. References LLUICtrlFactory::getComboBoxByName(), onCommitResolution(), LLView::setVisible(), and TRUE. Definition at line 880 of file llfloatersnapshot.cpp. References LLPanel::childSetEnabled(), LLPanel::childSetValue(), LLPanel::childSetVisible(), FALSE, LLUICtrlFactory::getComboBoxByName(), getLayerType(), getPreviewView(), LLUICtrlFactory::getRadioGroupByName(), LLControlGroup::getS32(), getTypeIndex(), gSavedSettings, LLComboBox::selectNthItem(), setResolution(), LLRadioGroup::setSelectedIndex(), LLSnapshotLivePreview::setSnapshotBufferType(), LLSnapshotLivePreview::setSnapshotType(), LLSnapshotLivePreview::SNAPSHOT_BITMAP, LLSnapshotLivePreview::SNAPSHOT_POSTCARD, LLSnapshotLivePreview::SNAPSHOT_TEXTURE, LLViewerWindow::SNAPSHOT_TYPE_COLOR, and TRUE. Referenced by onCommitSnapshotType(), and LLFloaterSnapshot::postBuild(). Definition at line 812 of file llfloatersnapshot.cpp. References LLSD::asBoolean(), LLPanel::childGetValue(), FALSE, gCameraToolset, LLToolMgr::getCurrentToolset(), LLView::getParent(), getPreviewView(), LLRectBase< Type >::getWidth(), gSavedSettings, gToolMgr, LLFloaterSnapshot::impl, mAvatarPauseHandles, mLastToolset, LLView::mRect, LLCharacter::requestPause(), LLView::reshape(), LLControlGroup::setBOOL(), LLToolMgr::setCurrentToolset(), LLView::setEnabled(), LLView::setMouseOpaque(), LLView::setVisible(), LLFloaterSnapshot::sInstance, LLCharacter::sInstances, and TRUE. Referenced by onCommitFreezeFrame(), and LLFloaterSnapshot::show(). Definition at line 755 of file llfloatersnapshot.cpp. Referenced by updateLayout(), and ~Impl(). Definition at line 757 of file llfloatersnapshot.cpp. Referenced by updateLayout(), and LLFloaterSnapshot::~LLFloaterSnapshot(). Definition at line 746 of file llfloatersnapshot.cpp. 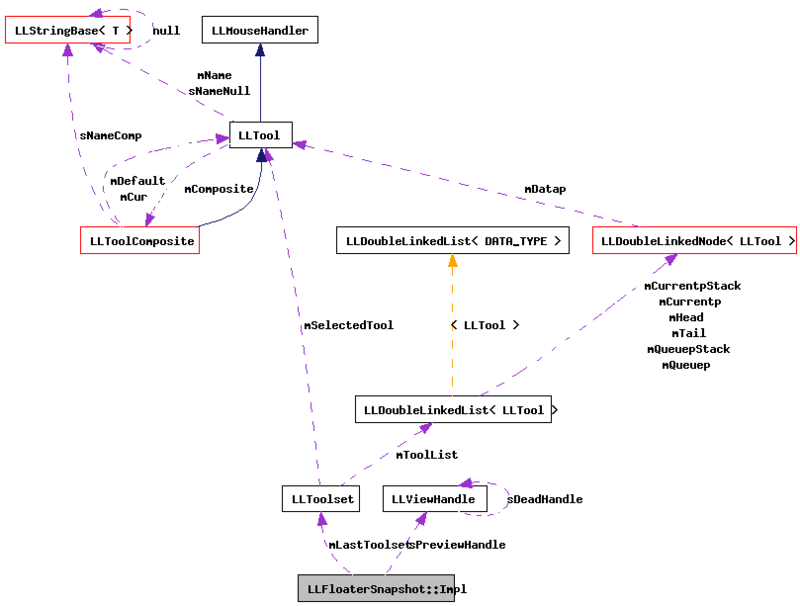 Referenced by getPreviewView(), LLFloaterSnapshot::postBuild(), and LLFloaterSnapshot::~LLFloaterSnapshot().